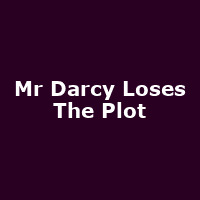 "Jane Austen is dreaming up Darcy, a proud, lip curling, handsome creation in very tight pants. But then a door squeaks, a visitor approaches and Jane hastily hides her writing. Mr Darcy is left dangling. Left to his own devices he embroiders his own storyline while his creator stitches her quilt. When Jane returns she finds Darcy is diving into a lake in a clinging white shirt, dancing the Berserka (a more extreme sports version of the Mazurka) and wrestling carp."